Vitamin E is an amazing drug and has lots of health benefits. It is good for your eyes, skin and hair also. It is an antioxidant and fat-soluble, which is found mainly in green leafy vegetables, seafood, nuts and seeds, and fruits. You can take Vitamin E supplements according to the advice of your doctor, if your body fails to absorb the nutrients from the diet you take. Applying Vitamin E on your skin provides enough nourishment to the skin and applying it on your hair and scalp makes your hair grow well. The dirt, grime and other impurities on your skin can be removed with the help of Vitamin E. It also helps in maintaining the oil balance of your skin. All you have to do is to add a few drops of Vitamin E oil on a cotton ball and wipe your face with it. Using it two times a day can help in cleansing your skin. Vitamin E helps in rejuvenating your dehydrated skin and keeping it moisturized. Add a few drops of Vitamin E oil to your night moisturizing lotion and apply it on your body at night before you go to sleep. Vitamin E is oil soluble and therefore heavier than the water soluble products. It restores the lost moisture on your skin and thus helps in treating dry and damaged skin. If you have dry and cracked finger nails and cuticles, you can use Vitamin E oil to treat them. Take Vitamin E oil on your fingers and rub it on the cuticles and the nails. Massage a little with this oil. This can heal the dryness and make your nails look shiny and beautiful. The stretch marks that appear on your skin after delivery can be made to fade with the help of Vitamin E oil. Apply vitamin E oil regularly on the stretch marks and massage gently in circular motions. With regular use you will see the stretch marks fading. This is because Vitamin e has the ability to restore the elasticity of the skin. Dark spots appear due to free radical damage, liver problems, aging and so on. Vitamin E is very effective for removing dark spots on the skin. Break a capsule of Vitamin E oil and add it to your body lotion or carrier oil like olive oil. Apply this on the dark spots. If you use it once daily, you will see that the dark spots have become lighter. Vitamin E is good for preventing dull skin, as well as wrinkled and saggy skin. It increases the production of collagen, which is a fiber-like protein that helps in maintaining the elasticity of your skin. As a result, signs of aging like fine lines, wrinkles etc are reduced. You get relief from painful cold sores by applying Vitamin E oil on them. This is because of the moisturizing properties of Vitamin E oil. Break open a Vitamin E capsule and apply it on the blisters. You will soon get relief the stinging sensation caused by cold sores. Vitamin E is an excellent remedy for sunburns. Take a few drops of Vitamin E oil and rub it on the area where you have sunburns. This helps in soothing the sunburns. This is because Vitamin E contains antioxidants that can reverse the harmful effects of free radicals hat are caused by the UV rays of the sun. Massaging your hair with Vitamin E oil regularly helps in conditioning your hair and scalp. This way you will have healthy hair with a natural shine. This is because Vitamin E is a natural moisturizer and helps in keeping your scalp and hair well moisturized. This makes your hair smooth, soft and glossy. Vitamin E can delay the aging process of both your skin and the hair. The antioxidants that are present in Vitamin E can prevent corrosion of tissues. This in turn helps in reducing premature graying of hair. Take 3 ounces each of olive oil, coconut oil, hemp oil and jojoba oil, and 2 ounces of Vitamin E oil. Mix them well and apply this mixture on your scalp and hair. With regular use, you can get rid of split ends and have healthy and beautiful hair. Applying Vitamin E on your hair makes your hair follicles strong and promotes hair growth. Break open the Vitamin E capsule and mix the extract with warm olive oil or coconut oil. Apply this on your scalp and hair and massage for a few minutes. Wait for 30 minutes and then wash off with lukewarm water. This helps in increasing the circulation of blood in the scalp and conditions your hair from the roots to the tips. As a result, your hair starts growing strong and healthy. 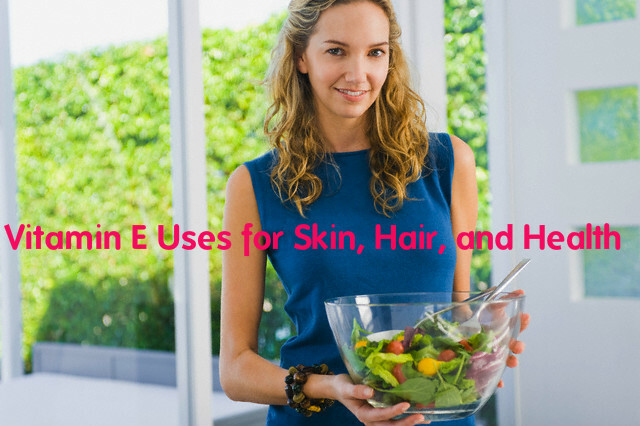 If you have scars caused by burns or acne, Vitamin E can be very beneficial for removing them. Apply a few drops of Vitamin E oil on the scars and massage gently in circular motion. With regular application you can get rid of the scars. Add a few drops of vitamin E oil to your sunscreen and apply it on your skin. This can help prevent skin cancer. This is because of the antioxidants present in Vitamin E. Vitamin E is also good for treating other skin disorders like psoriasis and eczema. Take a few drops of vitamin E oil on a cotton ball and apply this directly on the burnt area. You have to let the burn cool down and then apply the oil. Apply this repeatedly for a few days till the burns are healed.